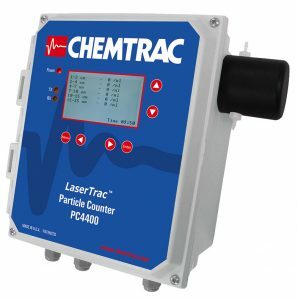 Liquid Particle Counter PC 4400 | Chemtrac, Inc. The PC4400’s performance reliability, ease of use, and measurement capability make it an ideal choice for online steam cycle corrosion product transport monitoring, and online filter performance monitoring and optimization. This is most clearly demonstrated in the PC4400’s ability to report as low as a 0.01 ppb level of IMCV > 2 (Insoluble Material Volumetric Concentration of particulate > 2 microns) in boiler/condensate systems, or in the case of water treatment applications, being able to detect filter breakthrough often hours in advance of any turbidity (NTU) change. The PC4400’s performance reliability, ease of use, and measurement capability make it an ideal choice for online steam cycle corrosion product transport monitoring, and online filter performance monitoring and optimization. This is most clearly demonstrated in the PC4400’s ability to report as low as a 0.01 ppb level of IMCV>2 (Insoluble Material Volumetric Concentration of particulate > 2 microns) in boiler/condensate systems, or in the case of water treatment applications, being able to detect filter breakthrough often hours in advance of any turbidity (NTU) change. Close to two decades of customer experience with Chemtrac’s Particle Counters has proven the effectiveness of this technology to take water quality monitoring to the next level. 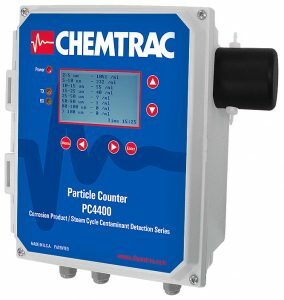 Chemtrac’s PC4400 is the right choice if the optimization demands of your application are not being met by relative and less sensitive measurements of water quality like those provided by turbidimeters or SDI test systems.